would any of you boffins out there be able to instruct me on how to check/change the impellor in a Mercury Blueband 20hp ? I have run the engine immersed in water, and also with bellows, but all I get is Steam/exhaust smoke through the blow hole. Is this a sign of impending disaster, or can it be rectified ? Drop the lower leg off (3 visible bolts, one under the trim tab). Impeller is on the drive shaft inside a plastic casing. DON'T lose the locator key when you remove the impeller! Could just be a blockage in the hole - pass a piece of fine wire or strimmer line down it first!!! It is almost certainly a sign of no effective water pump operation if steam is coming out. It is a straightforward task to drop the lower unit and replace the impellor, don't just check it. The widely accepted best practice is to check every year and if OK replace bi annually but if in any doubt replace. An impellor from key parts in watford is about £12 for a sierra bit although a OEM one would be a little more. If you don't have a manual look at the iboats.com website to find out how to do it. One of the most important reasons to drop the LU off is to grease it up and not let it seize on. Really its a great little job and will give you confidence to tackle other things on the OB later. Thankyou Dave, I will look up iboats directly. Hi, I looked on the iboats site, but could not find the information on how tocchange the impellor on my Mercury 20 HP blueband (200 model). I was wondering if anyone, maybe Nos , could help by posting the information I need. Ica't identify the three bolts which have to be removed, and wouldn't know what to do when I removed them. Apologies for being thick, but was always told by my father " If you need to know anything, ASK"
The pic is of an Opti lower unit. You may have a different number of bolts/nuts, but the principle is the same for all Mercs. First make sure you know which direction your engine turns in when running. Mark it on the flywheel if it's not marked. Put the engine into neutral. 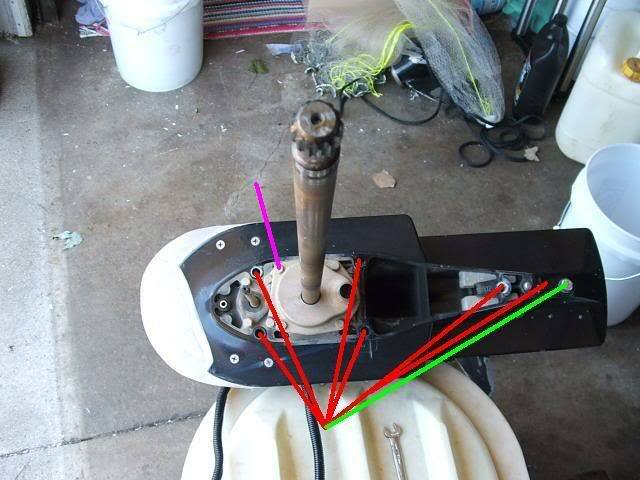 Remove the trim tab (Green line-bolt accessable from above-may be an allen bolt). Undo any bolts underneath it when it drops off. Tilt the engine fully if it's on your transom. From underneath, undo all visible nuts (red lines-don't use a socket )-remembering to leave one of the forward nuts on a couple of turns. This stops the lower unit falling off suddenly. Give the lower unit a pull downwards in line with the leg. It should come loose and drop against the last nut. If it doesn't, wiggle the lower unit about by hand-hard(ish) while applying steady downwards pressure. DON'T HIT IT ON THE ANTI-VENTILATION PLATE.All this will achieve is a broken anti-ventilation plate. If it won't come off,do it all back up and take it to a techie. All you'll do is break it if it's stuck. Once it's dropped against the last nut, undo that last couple of turns and the lower unit will drop.Don't let it impale you or hit the floor. On the separated lower unit, undo the impeller housing bolts (purple line-may be more or less than the 4 visible). Lift the housing off. It'll be stiff to move so do it carefully as you don't want to damage the gasket face underneath. This will expose the impeller. It'll probably look like the one on the right-the one on the left is a new one. If it'll come off, lift the impeller off (DON'T LOSE THE LOCATING KEY!). Clean off the old impeller housing gasket. Put a new one on with a thin smear of grease on it. Put the new impeller on. To get the housing to fit down onto it, grease the inside with a very thin smear of grease and push it downwards while turning the driveshaft in the direction the engine turns. Grease all the splines on the driveshaft and gear selector shaft lightly. Too much will make it hard to refit the lower unit. Refit your lower unit,making sure it's still in neutral and the gear selector rod and the water pickup pipe are correctly located.If it's dropped into gear, put it back into neutral using pliers with a rag inside the jaws. The driveshaft probably won't line up immediately. To line it up, turn the flywheel slowly. Thanks for that, I will attempt to dismantle it tomorrow and will post(maybe with pictures) if I get into difficulty. I have to go to the boat shop in the morning to pick up control cables, so I will get a new impeller then. All times are GMT -5. The time now is 18:55.